Everything You Wanted To Know About Coasteering! When looking at the range of surfing schools Cornwall has to offer, you will see that not only can you learn to surf the waves, you can take part in coasteering too. Coasteering involves exploring the coastline of an area by walking, running, jumping, and climbing. When coasteering you will navigate a coast both on land and by water, with varying levels of difficulty depending on your experience. 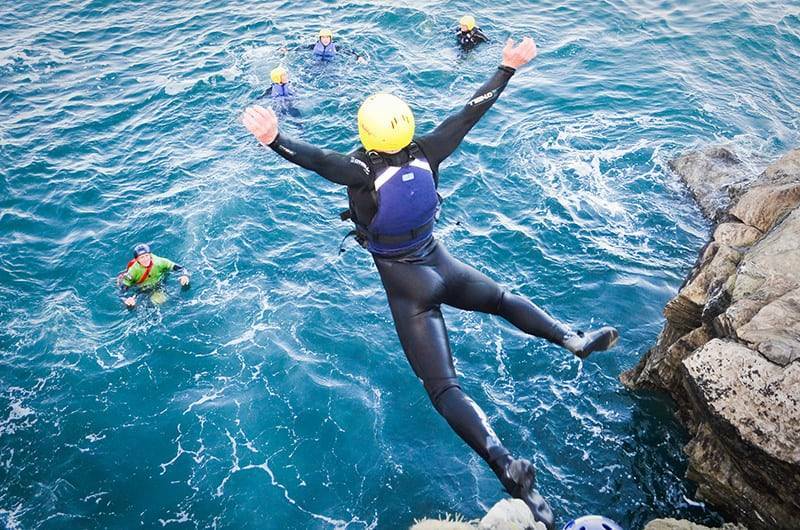 Coasteering is one of the most exciting ways that you can explore the outdoors and get fit. Many people think that coasteering is dangerous, but with the right support, training, and guidance it is safe. There are risks with coasteering as there are with many sporting activities, but if you follow the ‘rules’ and ensure you adhere to safety guidelines, the benefits far out way the risks. Newquay Activity Centre is one of the best surfing schools Cornwall has to offer and we ensure that the safety of our clients is paramount. Can anyone take part in coasteering? On the whole, yes! If you have a health condition or an injury it is best to speak to your coasteering instructor to see if you should take part in coasteering activities, but if you are fit then you can go right ahead! You do not have to be experienced to take part in coasteering, you just have to be willing to learn. 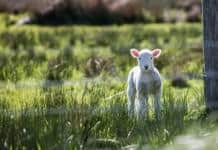 As you grow in confidence you can begin to explore more rugged coastlines or take part in more jumping and water activities, but everyone starts somewhere and the team at Newquay Activity Centre welcomes all levels of ability. Do I have to do big jumps? If you want to jump, then yes. If you don’t want to jump, then you do not have to. When you are coasteering you are the one that is in control and if you have particular reservations about an element of coasteering, your guide will be able to help you along the way. Coasteering is a great way to be at one with nature and explore the delights that the land and sea of the UK has to offer. When coasteering in the Newquay you can look forward to seeing plenty of wildlife, including birds, fish, crabs, and marine animals on your journey around the coast. 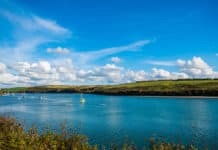 What should I wear when I go coasteering? If you choose to go coasteering with Newquay Activity Centre you will be provided with all of the safety equipment that you need, including wetsuits, helmets, and buoyancy aids. Thick soled trainers need to be worn, so that you do not cut yourself on craggy rocks and you should also bring a warm change of clothes for when you get out of your wetsuit. If you are looking at the surfing schools Cornwall has to offer, Newquay Activity Centre is one of the most diverse in the area. As well as coasteering, you can learn to surf, bodyboard, and take part in our Fistral Rangers activities.